Hey! Who Can Explain What India Does With Its Commas? (Not Commies. Commas.) : Krulwich Wonders... Numbers have different names in different places, and culture affects math just as it affects any language. In India they have different words for big numbers. When they see "10,000,000," they don't think "ten million." They think "crore." In India they have different words for big numbers. When they see "10,000,000" for example, they don't think "ten million." They think "crore." That is why the movie that swept 8 Academy Awards in 2009, which we call "Slumdog Millionaire," in Mumbai is called something else: "Slumdog Crorepati." So what is a "Crorepati"? Well, the key word here is "crore." Alex Bellos, in his book Here's Looking at Euclid, reports that "crore" is the Indian English word for 10 million. So the idea of "million" kicks in when you've got ten of them. One tenth of a crore has a different name. They call it "ten lakh." What's a lakh? Lakh is a hundred thousand. In the southwest Asian numbering system the word "thousand" gets retired at 99,999 and from there on they count by 100,000s. We don't have lakhs in the west. For some reason, they do. I had no idea numbers have different names in different places. And yet, culture affects math just as it affects any language. 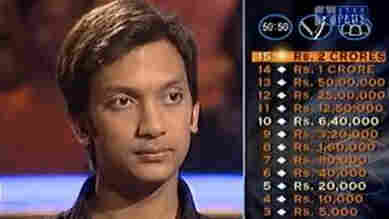 All you have to do is look at this image taken from a broadcast of India's "Who Wants To Be A Millionaire?" Look at the numbers on the right side of the image. They use "crores," not "millions." And there's another difference: the punctuation. They put their commas in different places, plopping them in every two zeros instead of three. If you compare British/American number notations with South Asian notations, the differences are very noticeable. Those commas in two decimal places are used not just in India, but in Pakistan, Bangladesh, Nepal and Myanmar, so I'm guessing that this form is really old -- maybe an ancestor of our own. After all, the folks who invented numbering systems lived in that part of the world, so what we call normal over here was probably a corruption of their system. Why this changed, I don't know. When I asked my friend Ezra Block (who is really good at finding out pretty much anything), he reported back that Indian mathematicians couldn't explain the comma placement, but thought it might be a recent invention from colonial times. It's a little hard to imagine some accountant at the East India Tea Company in 1770's flipping commas from trios to duos for no particular reason, and harder still to imagine a British punctuation catching on in Asia only, so I'm putting this problem into the Somebody Must Know category, and if that somebody is you, please write in to the comments below. I'd be curious to hear.